Billiard Balls and Foosballs also available. Single Shootout (#ES-MO1480W) $ 135.00 Single unit, comes with 2 balls and pump. Weight 42 pounds. 7/8" steel tubing. Equipped with magnetic scorers. Deluxe Double Shootout (#ES-MO1481W) 150.00. Comes with 4 balls and pump. Two player scoring. Weight 44 pounds. Equipped with magnetic scorers. 7.8" steel tubing. Double shootout. (#ES-MO1462W) Equipped with infrared eyes for scoring.. 1 1/4" steel tubing. Atomic double shootout. Heavy duty nylon netting and 9mm backboard for heavy duty play. Each goal is scored by infrared eyes. Weight 146 pounds. 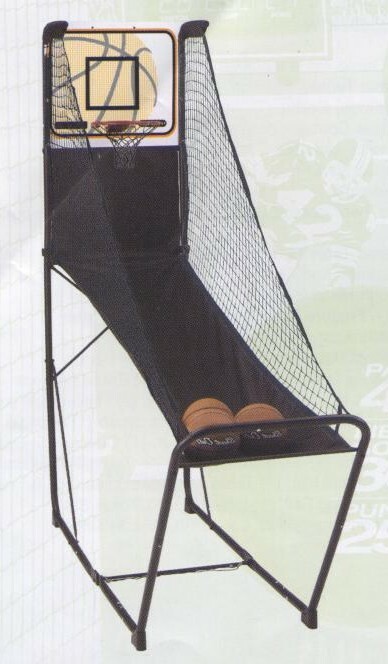 Includes 4 basketballs. (ES-MO1474W) $365.00. This is a commercial game. Stiga Ping Pong tables are available but they are shipped from West Coast and shipping is a killer. I suggest you check out Sam's BJ's Costco etc. as they get bulk delivery and I can't save you much money because of shipping costs.